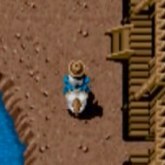 Description: Gunsmoke is a classic western shooter that was popular in arcades back in the 1980's. It was later released for consoles but the Arcade version was by far the best version. Play as a gunslinger trying to become the best in the west. Pass through towns killing all bad guys and taking out famous gunslinger bosses that threaten your life. Collect power ups to upgrade your guns power and score up. You can even ride a horse through some areas of the game!